I love using my crockpot. It makes days that are very busy, so much easier. I can start dinner in the morning and it will be ready and waiting when I need it in the evening. Beef Stroganoff is one of my favorite things to cook in the crockpot. It is one of those comfort type foods that is so nice to eat after a long day. One of the nice things about beef stroganoff is that you can change it up by sometimes serving it over rice and sometimes over noodles. My family does not complain about having the same meal over and over again if I do something as simple as changing what I serve it with. One complaint I have about most stroganoff recipes is that they often call for expensive cuts of meat. Now, it might make stroganoff a little better to use a beef tenderloin in it, but in my opinion that is a bit of a waste of beef tenderloin. If I am going to cook something in a gravy type sauce in the crockpot, why not use a cheaper cut of meat? So, for crock pot stroganoff I have used round steak, stew meat, and even a cheaper cut of roast. Really, I just use what I have and it works just fine. Dredge meat in flour and brown in oil. Place browned meat, onion, mushrooms, broth, and mustard in the crockpot. Cook on low for 6-8 hours or until the meat is tender. Stir in sour cream and serve over rice or noodles. I totally agree about using less expensive cuts of meat for slow cooker meals. It always works for me too. We made your Baked Pumpkin Oatmeal this morning for breakfast. I enjoyed how easy it was. And, we all enjoyed it. Thank-you for sharing your recipe. I posted a link to it on my blog. @michelle, I am so glad that you enjoyed it! I love stroganoff, but detest mushrooms. Do you have a recommended replacement that will fill the void without changing the flavor? @Wendy, But mushrooms are what make stroganoff good. 🙂 My son agrees with you though and picks them out. I think you could leave them out. I might add some extra onion or maybe a little beef bouillon or something like that to add a little extra flavor, but I think it would be find without the mushrooms. It would just be more of a beef and gravy that way not a stroganoff. Not only is using tenderloin a waste of money, I suspect it wouldn’t taste as good (tenderloin is just that, tender, but not as flavorful). 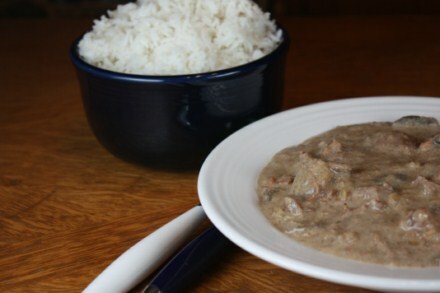 Besides, part of what makes the stroganoff so tender is the slow cooking of the connective tissue and fat that the tenderloin doesn’t have like chuck (what I usually use) or round would, so it’s even better with cheaper meat than expensive! Trying this out tonight. I’m so excited to leave the ‘packet’ behind! No onions for us though…. Can Stroganoff be made with a meat other than beef? @Ana, I have never had it with anything, but beef. I am not sure the flavor would be quite the same with another type of meat, but it might be worth trying. Made this for dinner last evening. The meat was tender but I was not overally impressed with the recipe and likely won’t be making it again.